Brad Gillman, MD, a native of Plymouth, Wisconsin, he earned his undergraduate degree from the University of Wisconsin at Platteville with honors. 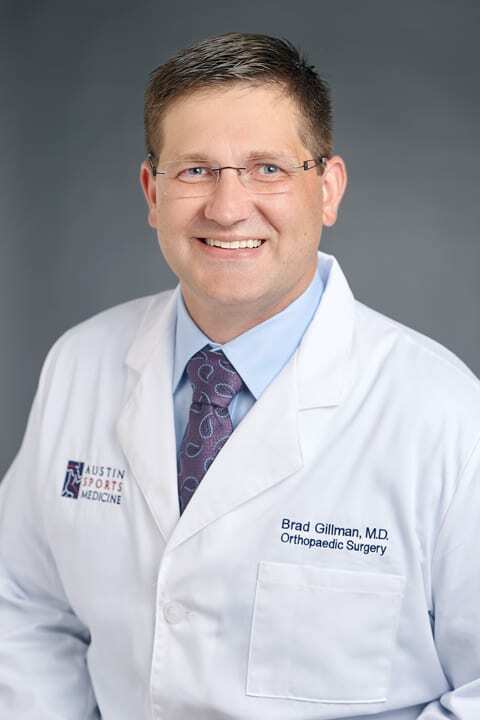 Dr. Gillman graduated medical school at the University of Wisconsin School of Medicine and Public Health and completed his internship and residency at Louisiana State University at Shreveport. He then completed a hand and upper extremity fellowship at Allegheny General Hospital in Pittsburgh, PA. To finish his training, Brad completed a highly coveted Shoulder and Elbow fellowship at UT San Antonio, learning advanced techniques in shoulder and elbow arthroscopy, arthroplasty and reconstruction. He is a member of the American Society of Surgery of the Hand and American Academy of Orthopaedic Surgeons. Dr. Gillman does not only treat upper extremity injuries, but will help you overcome any orthopedic injury. In his free time, he enjoys swimming and working out. He is an advanced SCUBA diver with rescue diver certification and enjoys traveling and he is excited to make Austin his home.